Most definitions of a manifestation crystal explain them as seed crystals. Some, including myself disagree with this description. A seed crystal is exactly that, a small crystal encased inside a larger one. 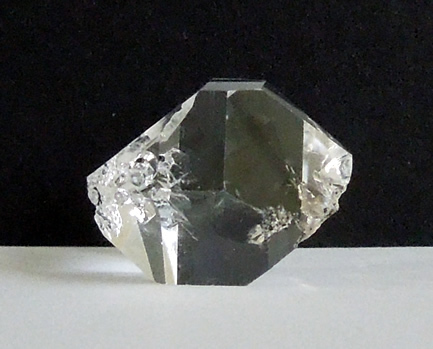 A manifestation crystal, however looks like a seed, but is an empty space. 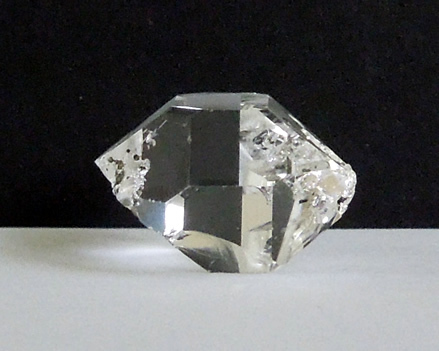 You can learn more about Herkimer Diamond inclusions at HerkimerHistory.com. The metaphysically inclined would be interested to know it is helpful in manifesting creativity or positive aspects within oneself. Carrying, wearing, or sleeping with a manifestation crystal promotes self-esteem, and can help those who have become withdrawn from traumatic events. The top picture shows a close up of the manifestation and quartz sphere. The quartz crystal sphere that moves in this manifestation is clear and has some black hydrocarbon in it. 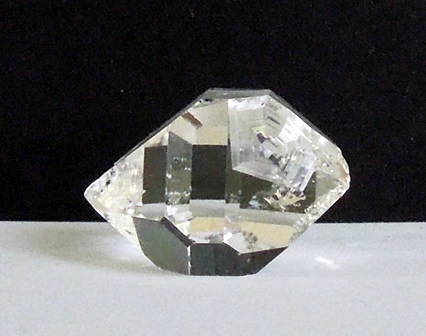 It moves about 2 mm as the Herkimer is slowly tilted back and forth. These spheres are also discussed at the HerkimerHistory web site. This is a complete Herkimer with some external growth occurrences. 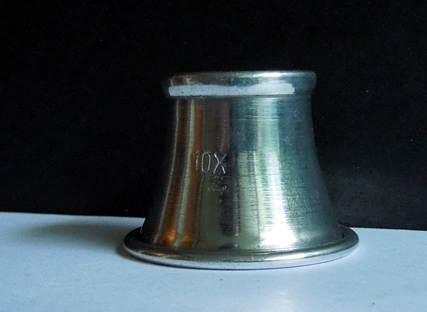 A well defined key mark is present and is seen in the top picture below. While it is technically double terminated, tips are marked with growth occurrences. The pictures represent it well. Other than the double terminated manifestation crystal, this Herkimer is clean inside. It shines brightly and clarity is excellent. 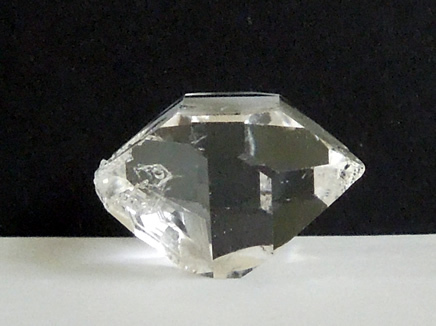 A large and spectacular Herkimer Diamond ! 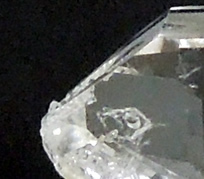 inside a double terminated manifestation crystal.